PALO ALTO, Calif. – Twenty years ago, procurement was a manual function driven largely by phone calls, faxes and handshakes. Then along came the Internet. And a company named Ariba. And everything changed. It all started with the idea that buying and selling among businesses didn’t need to be so hard. That with the right technology, companies could automate the process and interact in totally new ways that enhance their top and bottom lines. 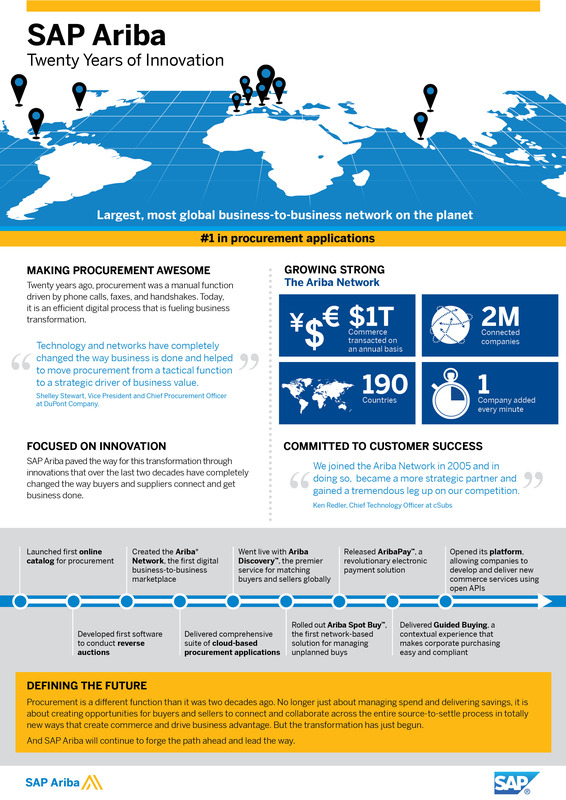 Created the Ariba Network, the first business network that today is the largest, most global on the planet, with more than 2 million companies transacting nearly $1 trillion in commerce on an annual basis. Went live with Ariba Discovery, a global business matching service that automatically connects buyer needs with seller capabilities. Rolled out Ariba Spot Buy, the first solution to combine the technology, content and expertise needed to gain visibility into unplanned buys with workflow capabilities to get them under control. Released AribaPay, an electronic payment solution identified as the most Disruptive and Best B2B Innovation.